2019 Chevrolet Silverado High Country in … high country. Recent history has shown that one byproduct of war is technical advancement. And rarely has that held more true than in the current battle for pickup-truck supremacy. If you look back at the long histories of its biggest players, the pickup market has traditionally been slow to evolve. Until fairly recently, the Big Three only redesigned their wares every decade or so, with changes coming more in styling than in content. Ford, GM, and Ram (nee Dodge) have all introduced redesigned pickups in the past four years – with GM’s and Ram’s coming on line as 2019 models. And Ford has made updates to its “aging” F-150 of late, keeping it thoroughly up to date. 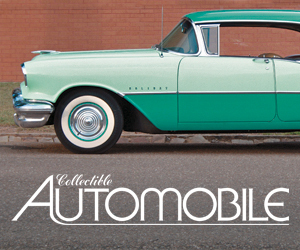 Powertrain advancements have been notable. Ram brought the first modern turbodiesel to the ½-ton segment back in 2014, Ford added one for 2018, and GM is due to join the fray later in the 2019 model year. There’s also been advancements to regular gas engines in the form of cylinder deactivation for V8s, turbochargers for V6s, and upcoming mild-hybrid versions of both. And then there’s transmissions. Most models of all the Big Three trucks boast at least 8-speed automatics, with Ford and now GM bringing out 10 speeds, while “stick shifts” are essentially a thing of the past. But those don’t really hold a candle to the comfort, convenience, and safety features now on offer. Lots of leather, a touch of wood, and ritzy two-tone color schemes leave the top-line High Country’s interior the equal of many luxury sedans’. To anyone who remembers pickups in their traditional elemental form – and has been asleep for 40 years – a crawl through a modern one would leave their head spinning. Interiors can be swathed in leather and wood, amenities are the equal of a luxury car, and safety features rival those of most family sedans. But the real shocker would be found on the side window, where stickers frequently top 60 grand. One other transformation has to do with body styles. Whereas a “pickup” used to be a regular cab with an 8-foot bed, those now make up a tiny fraction of sales — one estimated percentage being in single digits. By far the majority are crew-cab models with a bed of about five or six feet, with extended-cabs — some available with an 8-foot bed — making up the rest. The last point is pertinent here, as the redesigned 2019 Chevrolet Silverado will initially be offered only in crew-cab form, with extended- and regular-cab versions coming later. (In the interim, “carryover” versions of 2018 models will still be available.) So, too, will added engine choices, as the early models will all come with a V8, though V6, turbodiesel, and 4-cylinder turbo variants are due to arrive by the first quarter of the 2019 calendar year. Wait … a 4-cylinder? In a full-size pickup?!? Yep. But we won’t be touching on that for a while. Or the turbodiesel. If you’re worried that this means there won’t be many choices, rest assured that’s not the case. 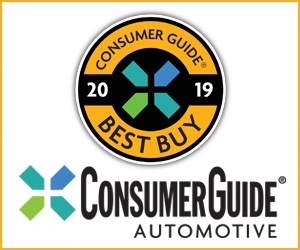 For one thing, there are eight different trim levels on offer — from traditional workhorses to loaded luxury barges and everything in between — and each carries a distinct grille. Eight trim levels are offered, with a different grille for each. The lineup (from right to left in the photo above) starts with the Work Truck, essentially a “stripper” model aimed at the commercial market. Then there’s the Custom, which isn’t much dressier inside but boasts a “sporty” body-colored grille and trim along with 20-inch wheels, and the Custom Trail Boss (new for 2019) with off-road equipment and a 2-inch suspension lift. Next come a quartet of mid-line models — which will make up the bulk of sales — in the form of the LT, RST (new for 2019, and essentially a “street performance” version of the LT), LT Trail Boss (also new), and LTZ, and then the line-topping High Country. 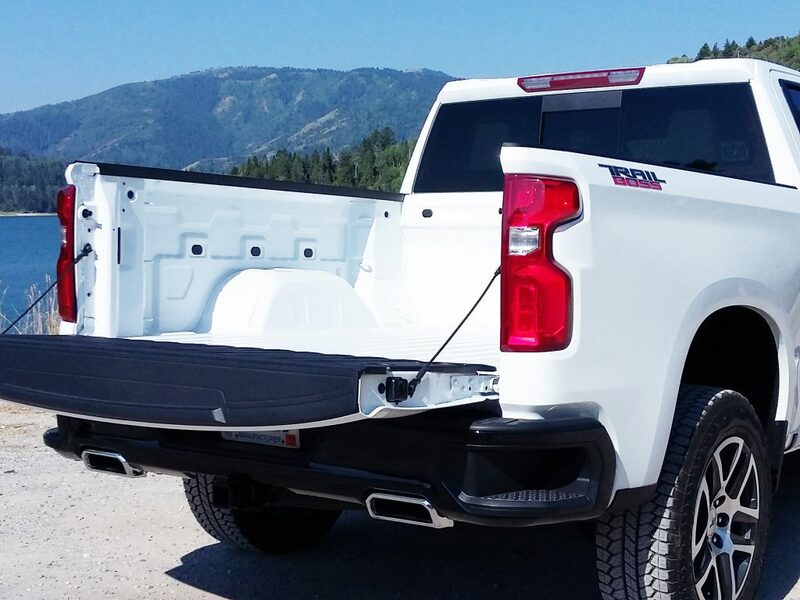 Notable “bed” features include a larger step in the corners of the rear bumpers, numerous top-to-bottom tie-down hooks, a wider load area, and an available power opening and closing tailgate, a segment first. 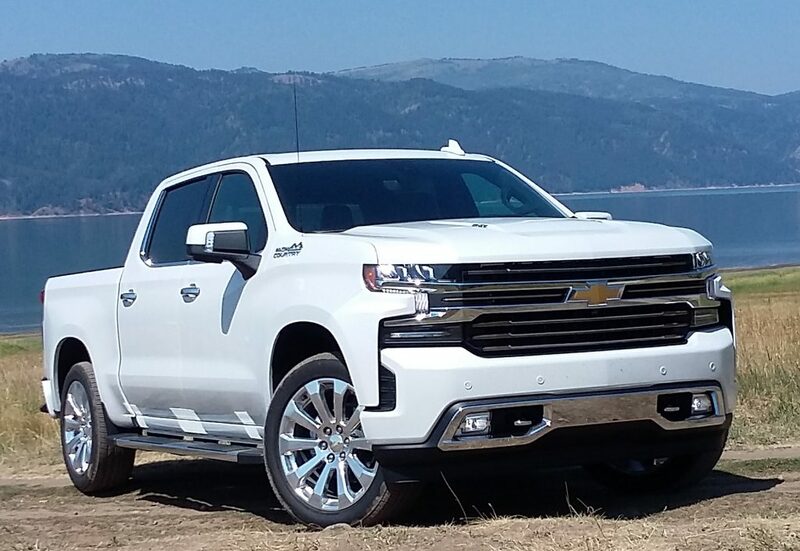 Although there are numerous changes to the 2019 Silverado in addition to the styling, a few really stand out. The cargo bed is about seven inches wider between the walls, which increases bed capacity. It also provides space for accessory bedside bins with locking covers that allow you to carry good-sized items under lock and key. The bedside walls are also quite tall – another aid to capacity – though that means even average-size folks standing beside the bed might have trouble reaching over the walls to grab something off the floor of the bed. 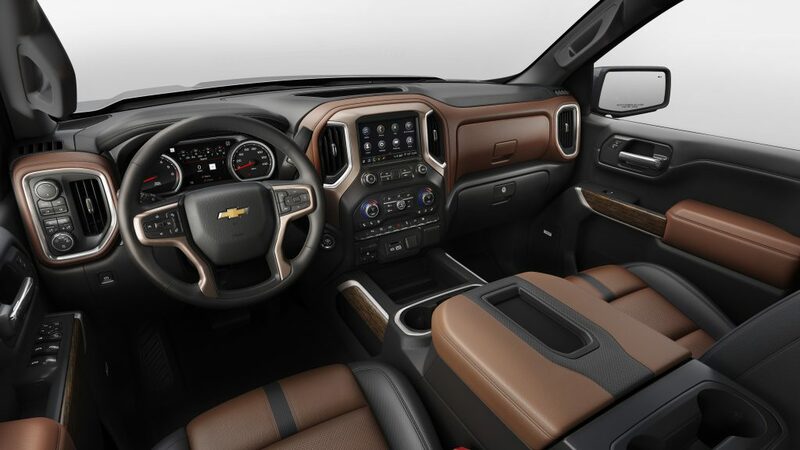 There are also larger steps built into the corners of the bumpers, along with an optional power-opening and closing tailgate – a segment first – which can be done through a button on the tailgate, a “myChevrolet” app on your phone, or (lowering only) from a button inside the cab. And speaking of the bed, there are 12 standard tie-down loops – three stacked top to bottom in each corner – along with holes where several more can be affixed. There are also a lot more high-tech features offered, notably in the area of safety equipment. Now on offer (some being new) are forward collision warning with pedestrian detection and low-speed automatic braking, lane-departure warning, lane-keep assist, blind-spot alert, and rear cross-traffic alert. Also new is a head-up display, which Chevrolet says is a class exclusive. Inside, the higher-line trim levels we drove were very nicely appointed with padded dash face, door tops, and armrests. Wood trim and two-tone color combinations are available to provide a richer look. The wider cargo bed allows for sizable accessory lockable storage bins that fit over the wheelwells while still leaving floor space for a 4×8 sheet of plywood to lay flat. Audio systems on these vehicles included volume and tuning knobs, with other settings being made through virtual buttons on the large dash screen. Climate controls include rotary temperature and fan switches, with mode being adjusted with individual buttons that allow defrost, dash, and floor vents to be activated simultaneously – a nice touch. The only downside here is that elements of the audio and climate systems that are far to the right might be a little out of easy reach for the driver. All vehicles we drove were crew cabs, and Chevrolet says the redesign brings three more inches of rear legroom to those models, resulting in huge amounts of headroom and legroom front and back. Flipping out the “doors” in the center of the rear seat backs reveals a couple of handy storage bins. 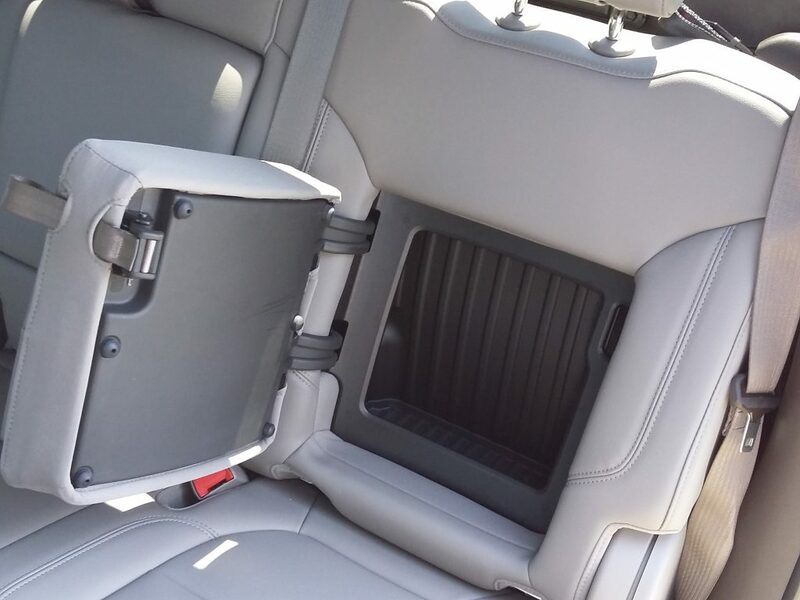 The rear seat cushion can also be flipped up to access a long storage bin underneath, and that — along with a nearly flat floor — provides for a huge channel that can accommodate a bicycle or big-screen TV. Cargo space inside is also very good, with upper and lower gloveboxes, large map pockets with cupholders in the doors, and – on models with front bucket seats – a huge console box and several console trays. (Those with a bench front seat have a flip-down center seat back/armrest that can hold quite a bit.) And in back, the seat cushion flips up to reveal a wide storage bin underneath. While most of that is common among large pickups today, this is not: Swing-out “doors” in the rear seat backs open to reveal hidden storage bins underneath. Clever. Less great is visibility. Front and side roof pillars are fairly thick, blocking quite a bit of the view out, though rear pillars are commendably thin. But cameras are used to good advantage here. Not only is there a standard rearview camera in the tailgate, but you can also get 360-degree cameras (which add them to the grille and each sideview mirror) and another mounted at the top edge of the back of the cab. 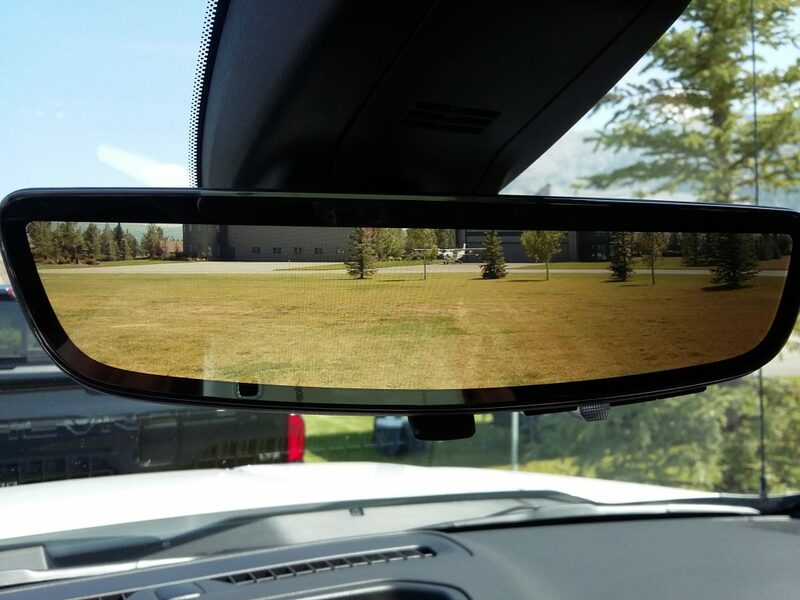 On Silverados so equipped, flipping the little black lever at the bottom of the rearview mirror replaces the “regular” view with one from a camera mounted above the rear cab window, perfect if people in the rear seat block your view back. With the flip of a lever, the last displays its image across the entire surface of the inside rearview mirror, useful if passengers or cargo in the rear seat block the driver’s view back. Additional camera views are helpful when trailering. One sights down over the hitch as you line up the trailer tongue, and two sight down the sides of the vehicle rearward so the driver can tell how the trailer is tracking. Another separate camera can be affixed to the back of the trailer (via a long cable) to aid the driver when reversing. There are a host of other trailering aids as well. For instance, the truck can be programmed to activate the trailer lights in sequence so a single person can do a light check, and – if the trailer tires are equipped with sensors – their pressure and temperature can be displayed on the dash screen to help prevent blowouts. 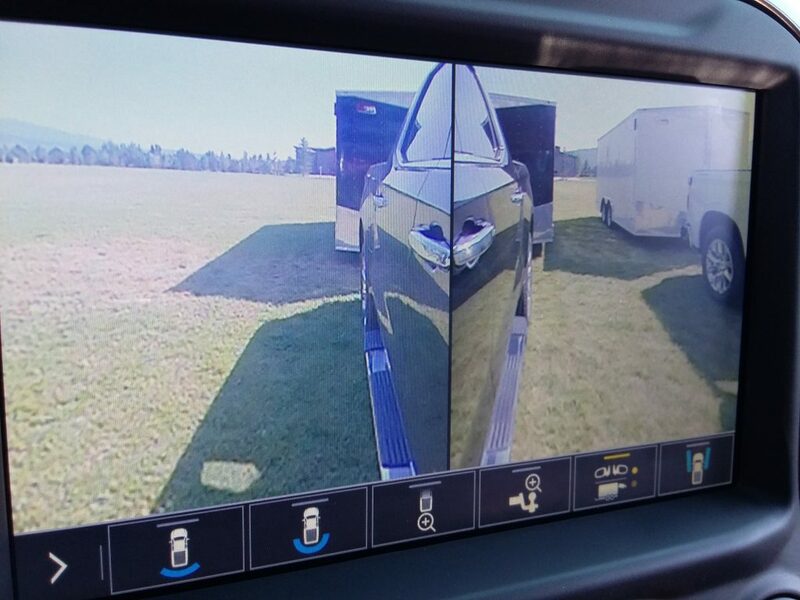 Other available camera views help when trailering, and there’s even an auxiliary camera that can be affixed to the back of the trailer, with its image fed to the dashboard screen when backing. Powertrains are largely new for 2019, though we were only able to test two of them: a new 5.3-liter V8 with Dynamic Fuel Management (more on this later) and 8-speed automatic, and a 6.2-liter V8 with Dynamic Fuel Management and 10-speed automatic. There’s also a 5.3 with Active Fuel Management and 6-speed automatic, a 4.3-liter V6 with 6-speed automatic, and – due later – a 2.7-liter turbocharged 4-cylinder engine and 3.0-liter turbodiesel. Whereas the pre-existing Active Fuel Management system can deactivate four cylinders under light load to save fuel, the new Dynamic Fuel Management system can run on two, four, six, or eight cylinders depending on load. Chevrolet says that a weight reduction of about 450 lbs on crew-cab models cuts 0-60 times by about 1/2 second, a notable achievement. That’s probably also helped by the 8- and 10-speed automatic transmissions, which largely replace 6- and 8-speed units in their respective applications. While we always like to judge ride quality around our home office in Chicagoland — not only because the roads are bumpy, but also because you’re grading all vehicles over the same bumps — the ride seemed to suffer from the same jiggle and reverberation over rough pavement that is typical of most pickups. (The Ram 1500 is somewhat of an exception in this regard, likely due to having coil springs in back instead of traditional leaf springs.) But if you’re already used to the jitter, you’ll probably find that the new Silverado rides quite well. Likewise, handling is fine for a pickup, though tall front fenders and large overall size means it’s tricky to slot into parking spaces. The quantity of features offered in the Silverado — and other top players in the class — is simply staggering, particularly if you’re focused on towing. But most large pickups seem to be purchased more as family vehicles with a substantial level of utility thrown in, and both of these customer profiles will find a lot to like in the new Silverado. Other pickups may offer different features, but few cover the gamut as well as this one. It’s all a result of the battle going on for big-pickup supremacy, and unlike in most other types of conflicts, “the people” definitely come out as the winners. Silverado’s crew-cab body is three inches longer than before, all going to rear-seat legroom — which was really good before and even better now. It’s the only body style that will be available when the truck goes on sale this month, though “carryover” versions of other cab/bed combinations will continue to be offered until the complete lineup of redesigned models is completed early next year. Written by: Rick Cotta on August 17, 2018.on August 21, 2018. Bring Back the Chevette! Seriously.